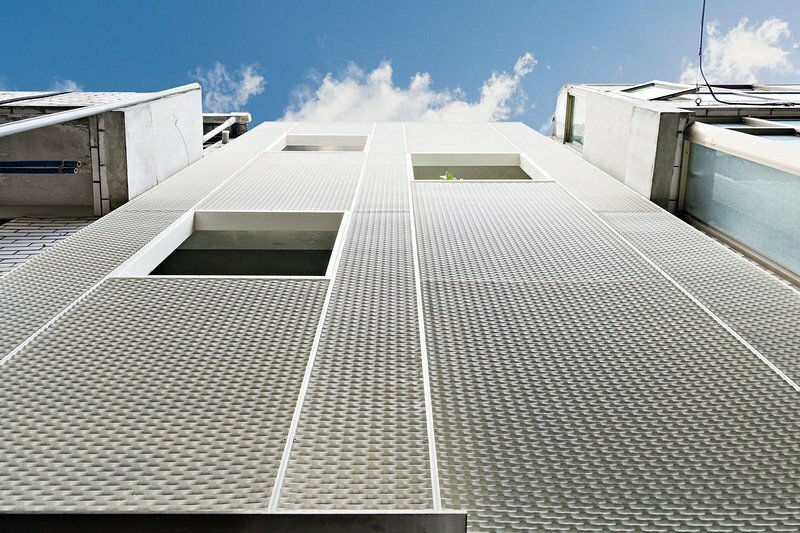 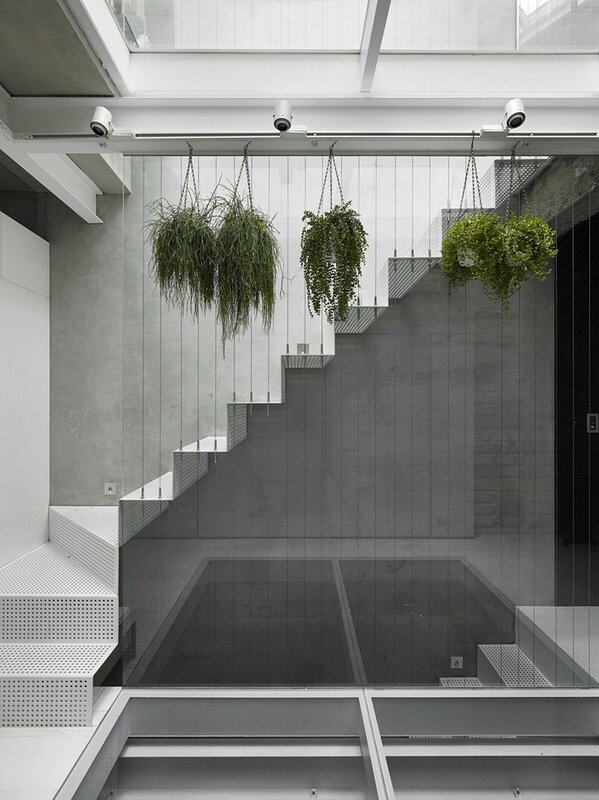 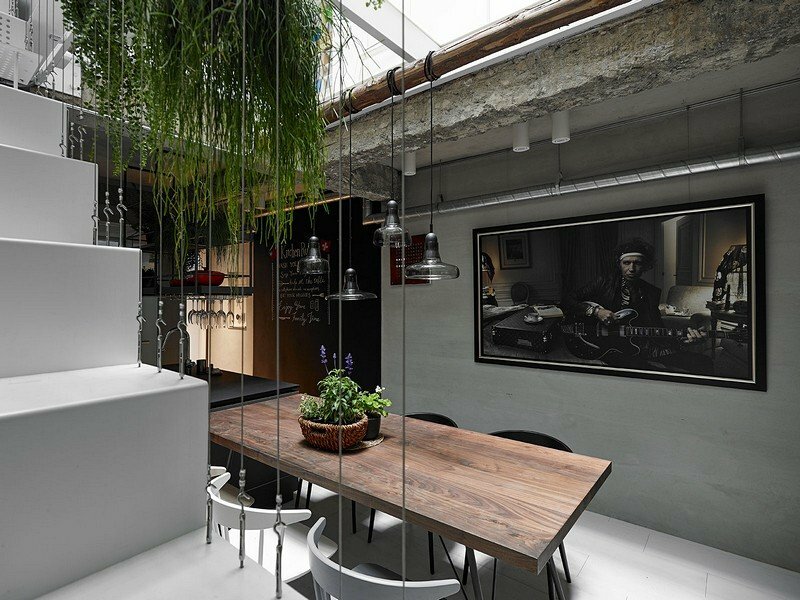 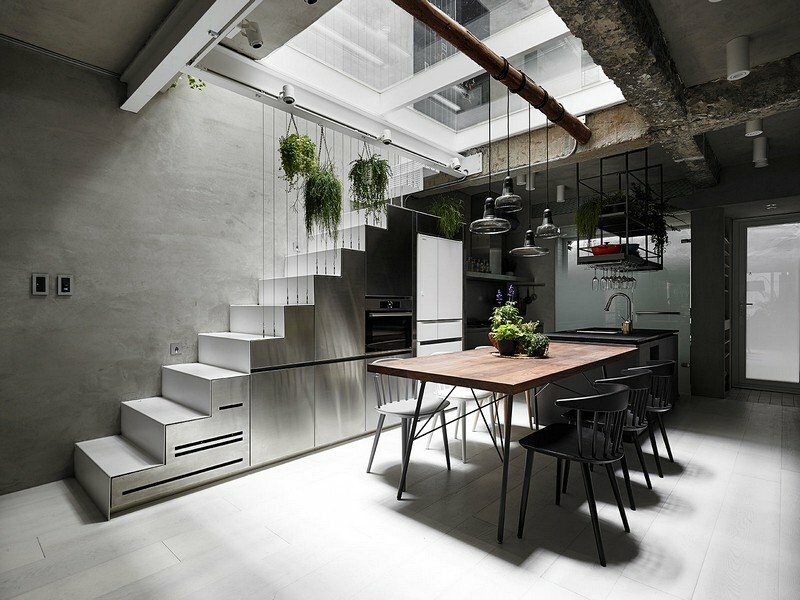 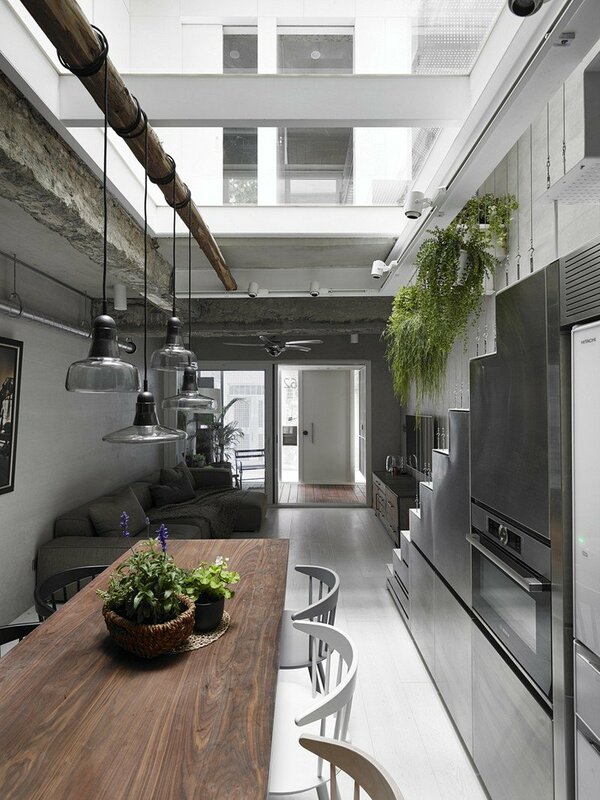 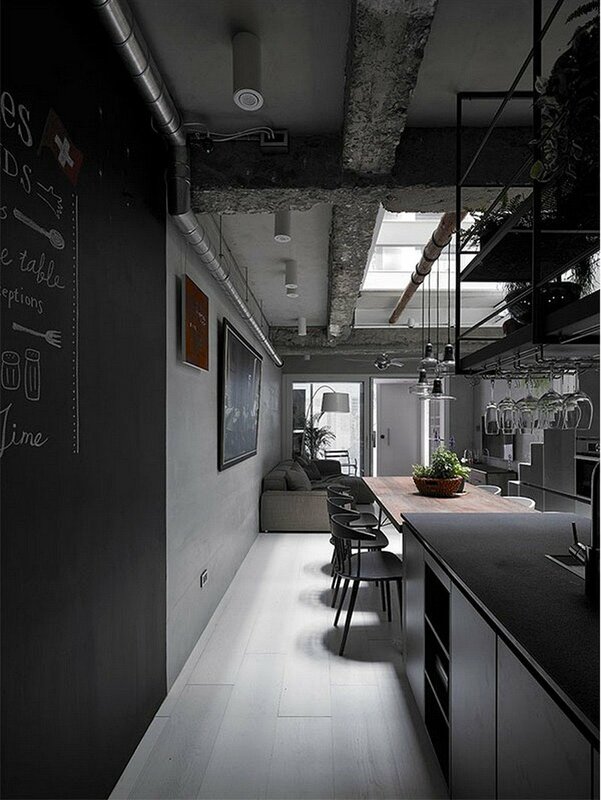 House W is a old three-story townhouse in Taipei recently renovated by KC Studio. 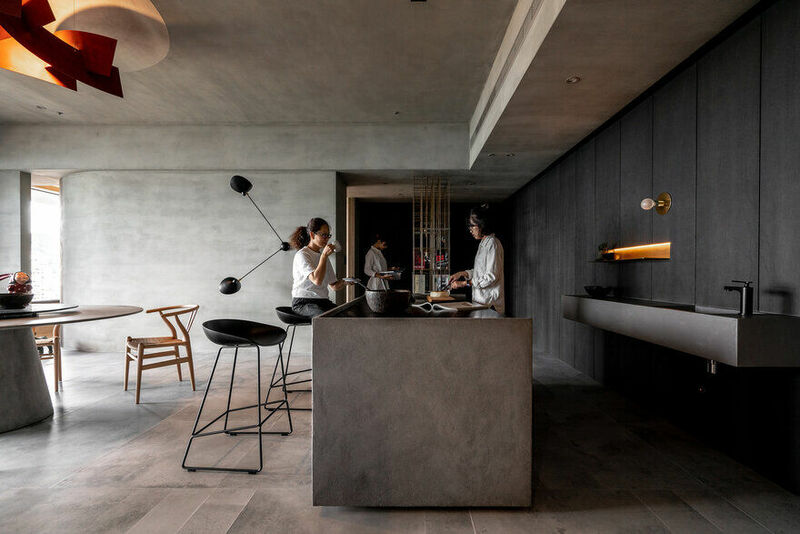 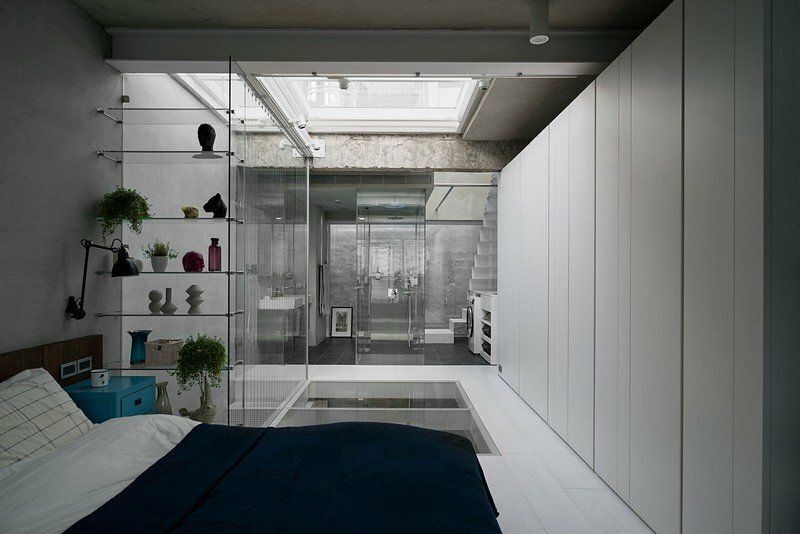 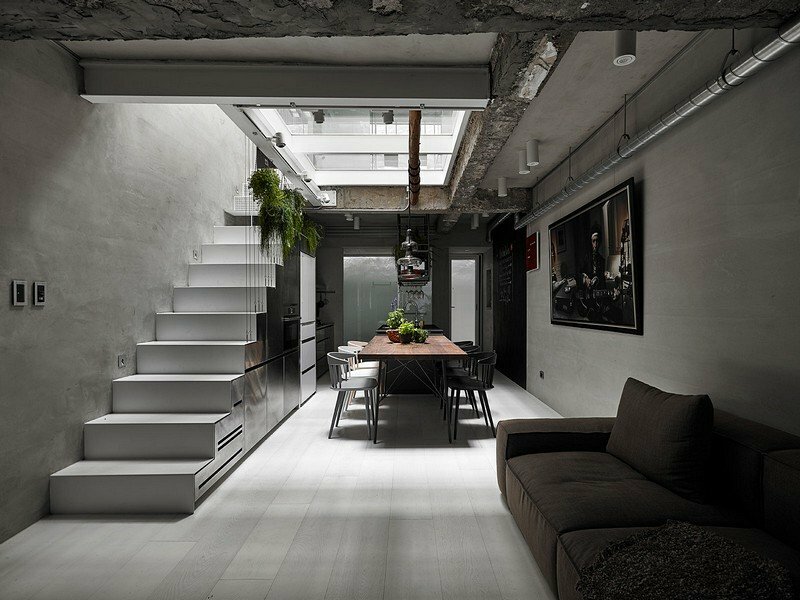 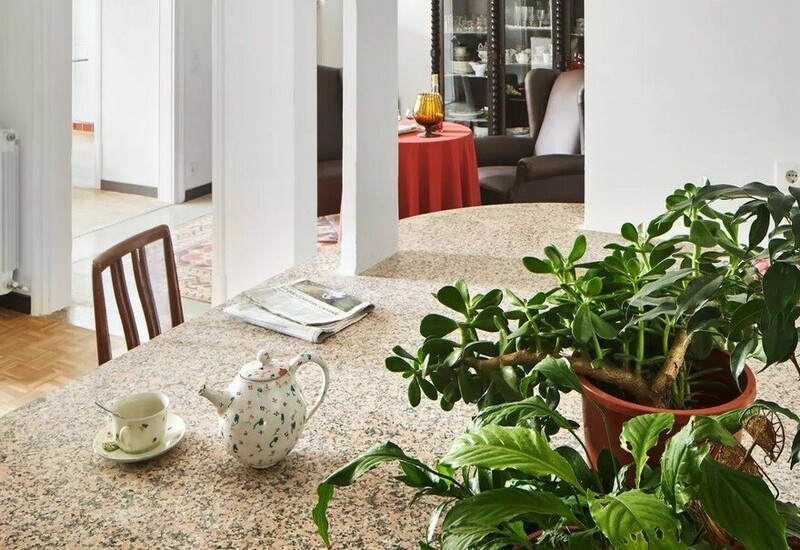 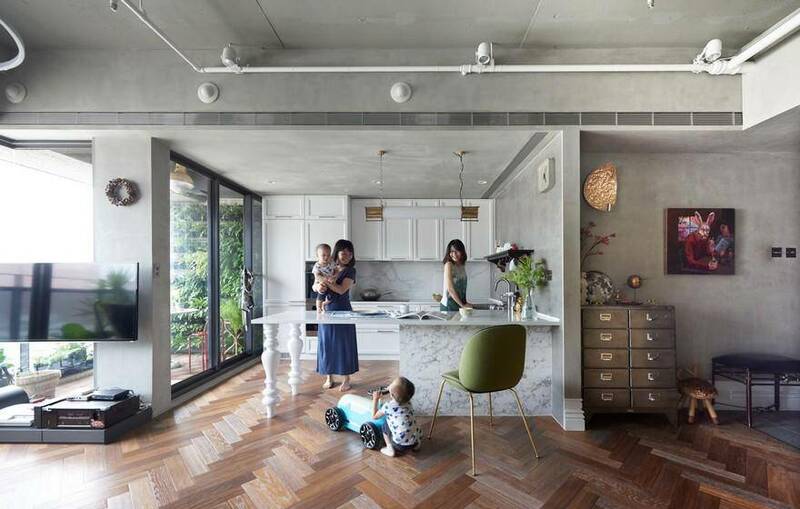 From the architect: This 50-year-old house is located in a high density residence area, with the typical design of three-story townhouse that you see often in Taiwan. 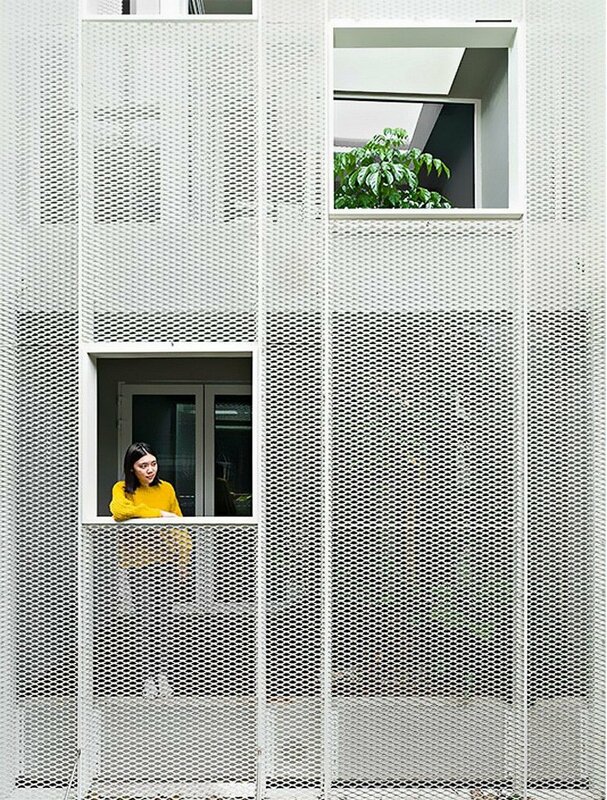 Main problems for this rectangular shaped house include poor daylighting, which is common for houses of this specific shape, and the close proximity to neighboring houses,which poses a privacy and security threat. 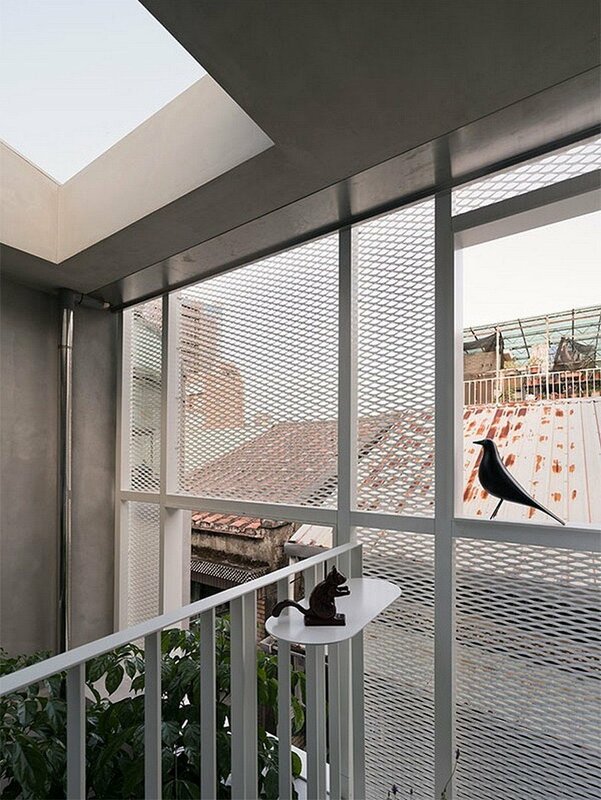 Also, noises from nearby tourism attractions and night markets are a nuisance. 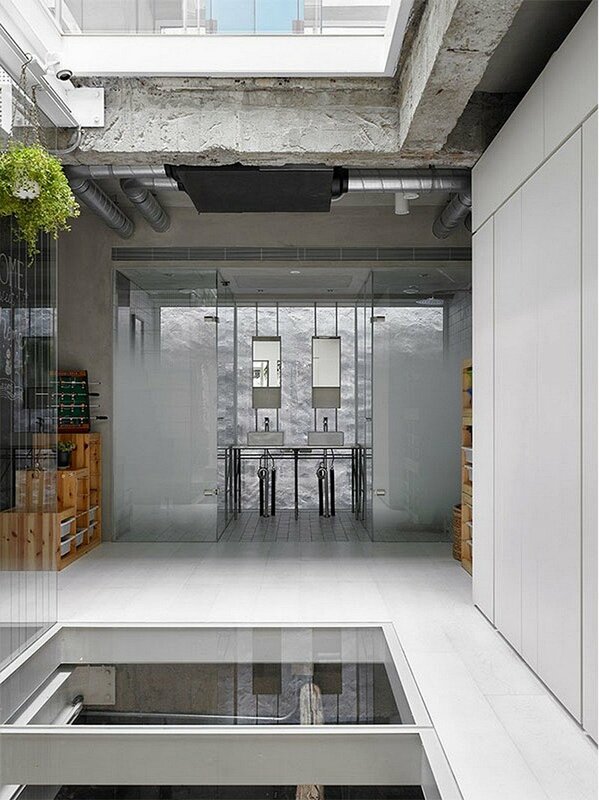 Considering the lack of privacy and good view, we decided to design the house inward and upward. 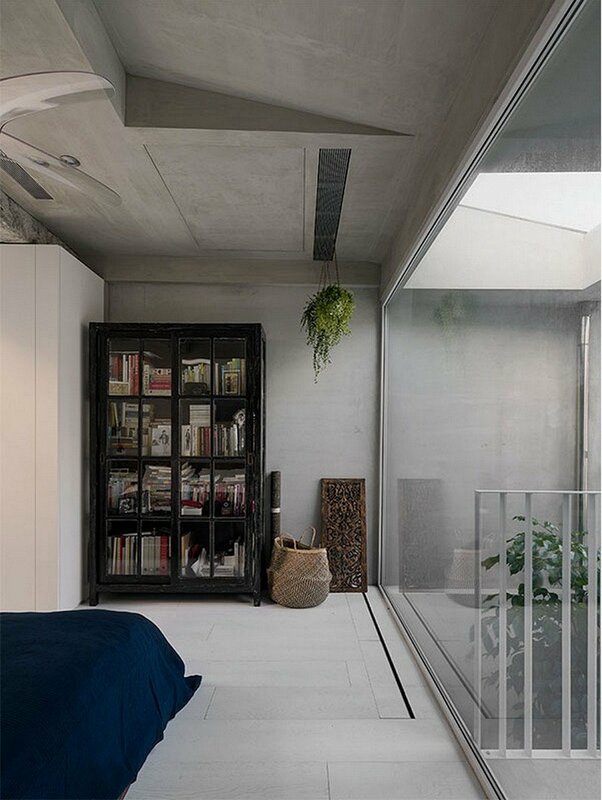 The front of each floor is set back to form a buffering semi-outdoor space between streets and residence areas, and with uses of semitransparent expanded meshand openings on the façade, we are able to set up boundaries but still introducing natural lighting, ventilation and rain to the inside. 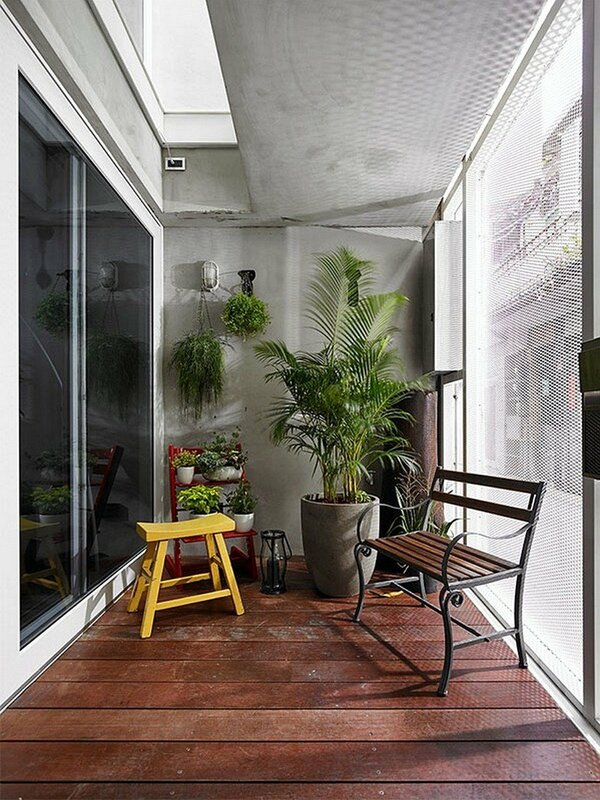 By removing partial ceilings and the use of atrium, these semi-outdoor spaces on three floors are linked, so the first-floor balcony will be used as doorstep with improved daylighting, while second-floor balcony plays as an extension to kids’ corner with trees and plants and the main suite on third floor can enjoy green garden view. 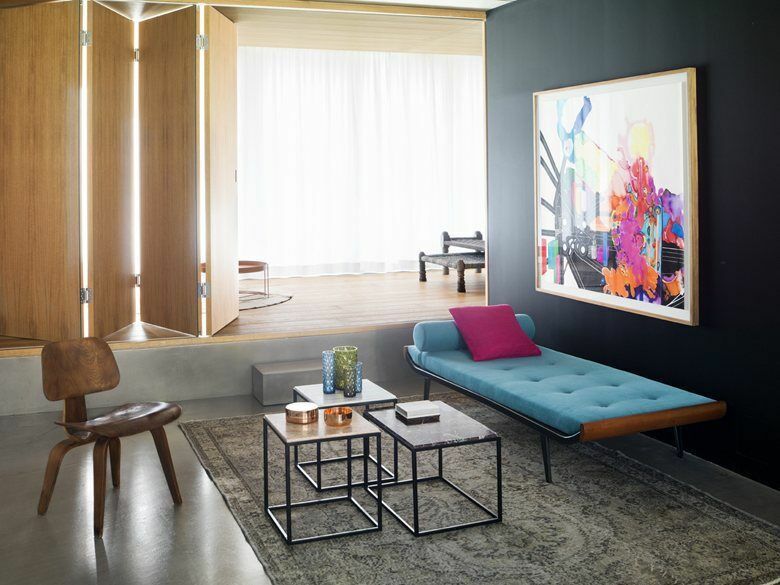 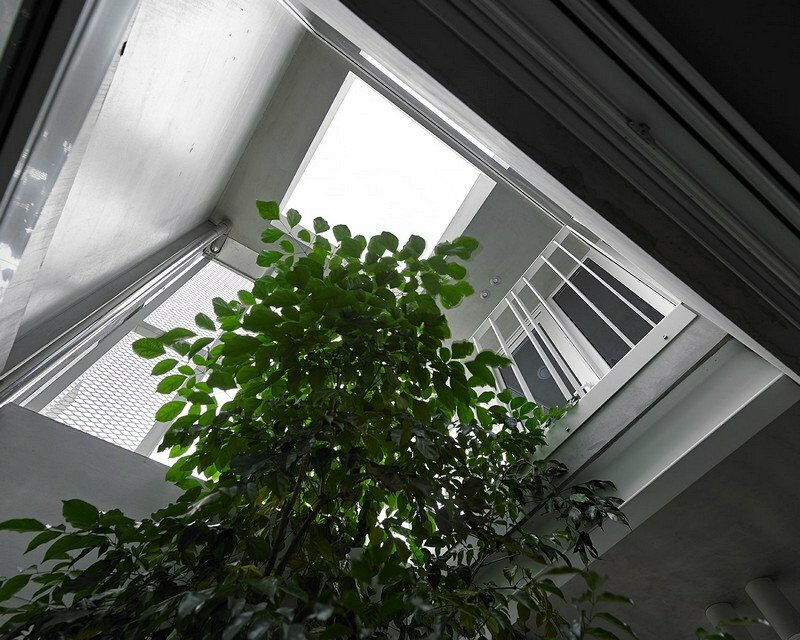 Lighting and ventilation are big factors in regard to the wellness of occupants. 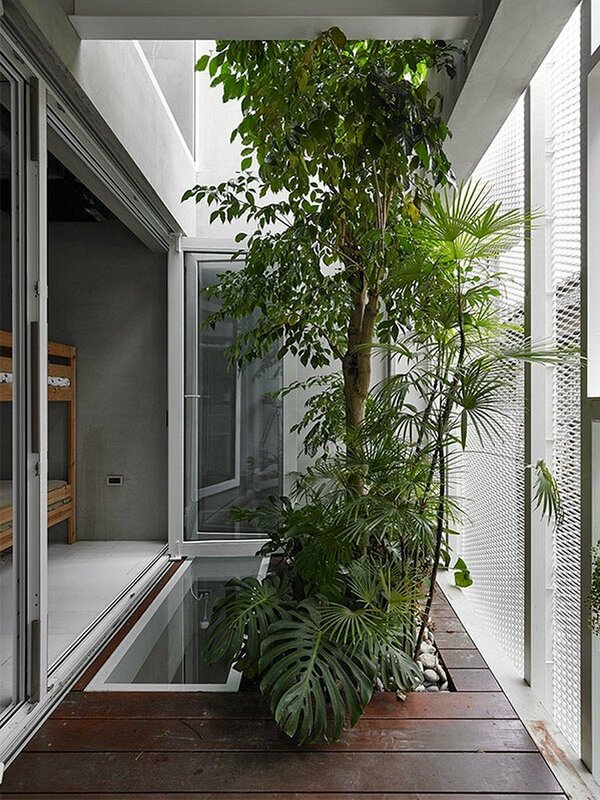 By large windows located both at the front and the back, and use of atrium in the middle, sunlight can naturally flow into every corner of the house. 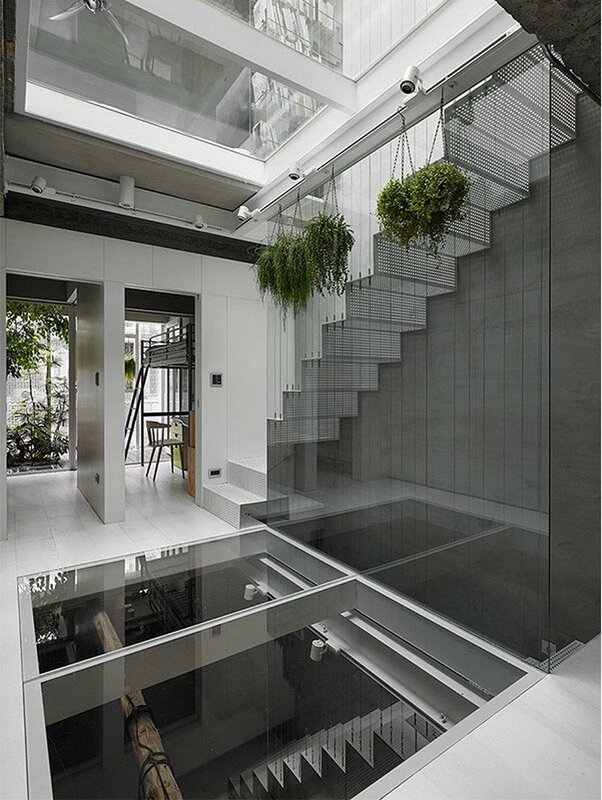 The middle atrium uses glass to keep floor area, and the surrounding stairs use perforated steel plate, llowing sunlight from above going through. 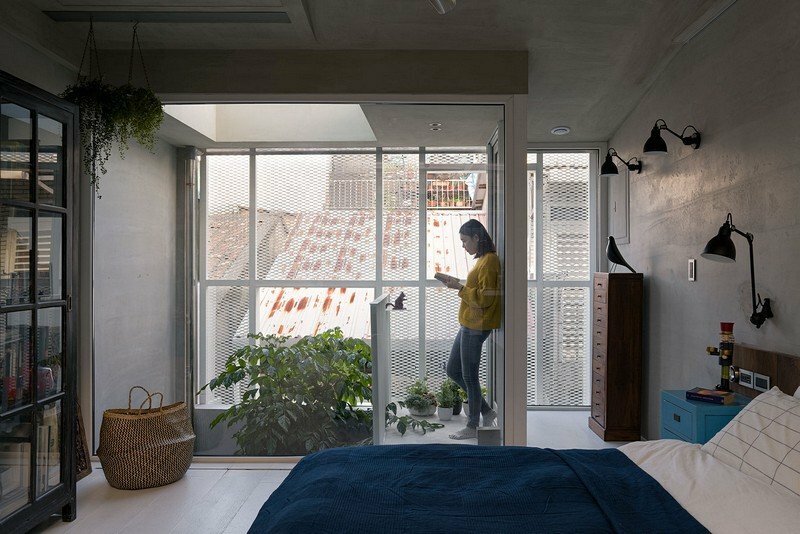 Also, the balcony at the back of the house is forfeited and set back so the distance to neighboring houses is expanded from 40 centimeters to 90 centimeters. 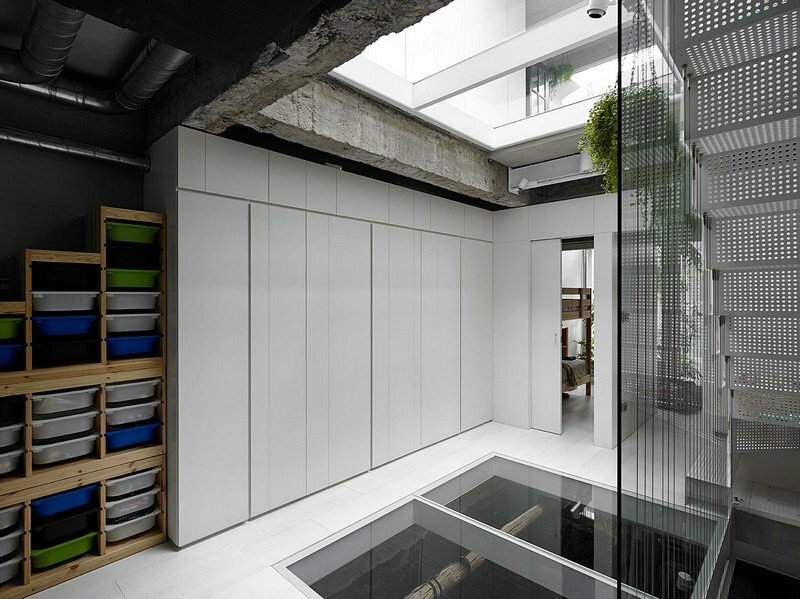 The toilet located at the back uses glass for partitioning to allow as much ambient lighting as possible. 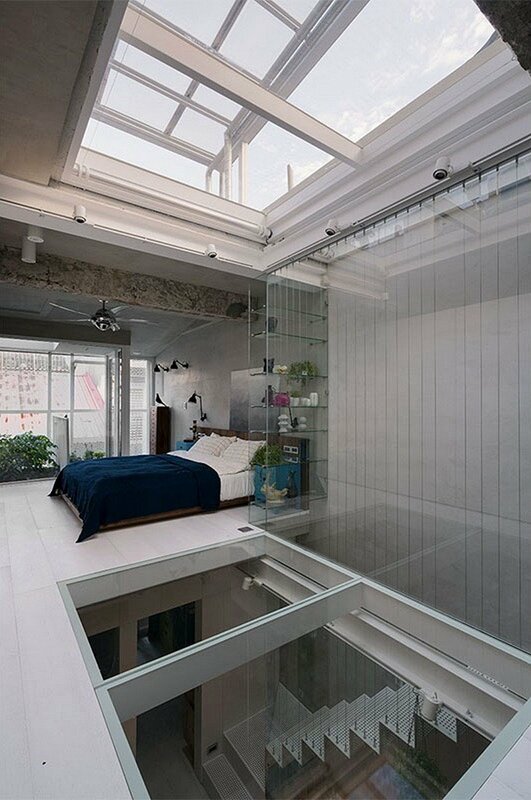 Each floor is handled as an open plane. 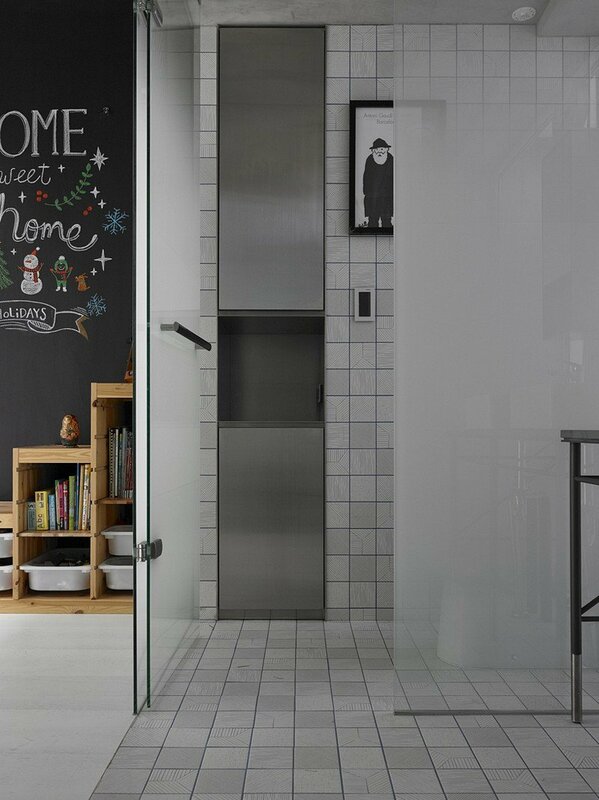 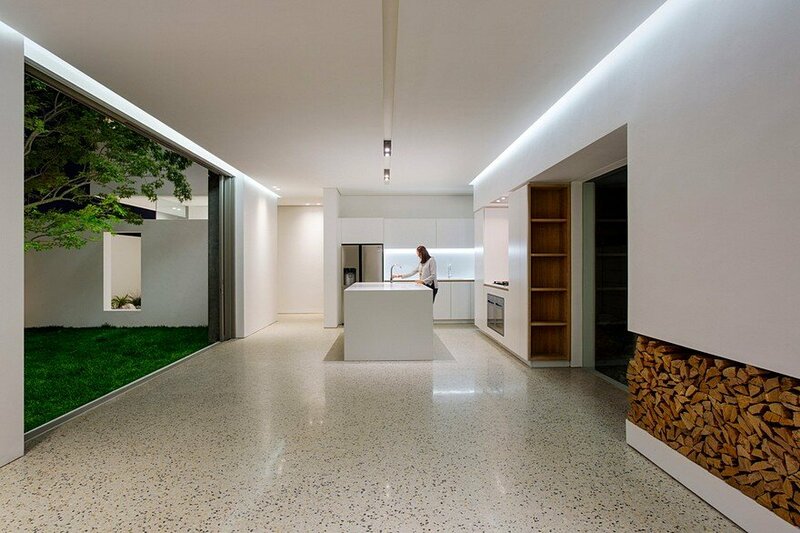 All cabinets are located against walls to maximize indoor floor area as the width of the house is only 370 centimeters. 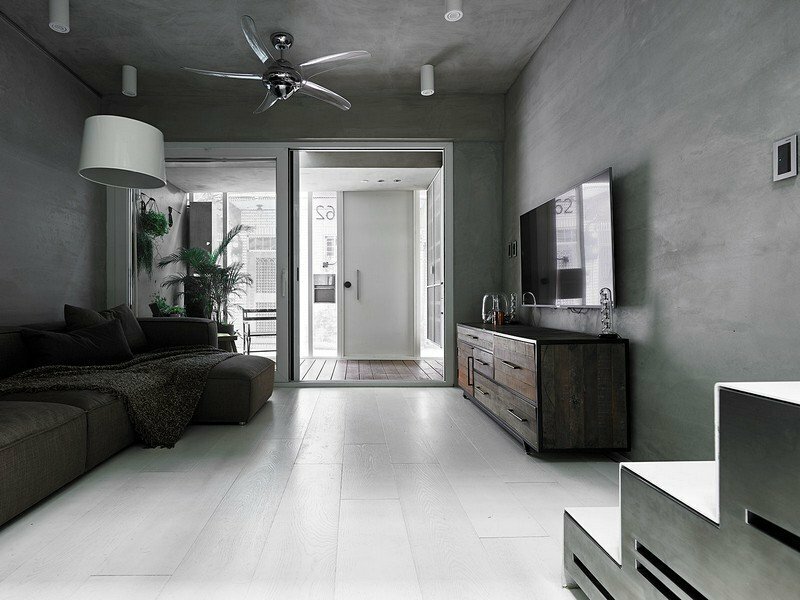 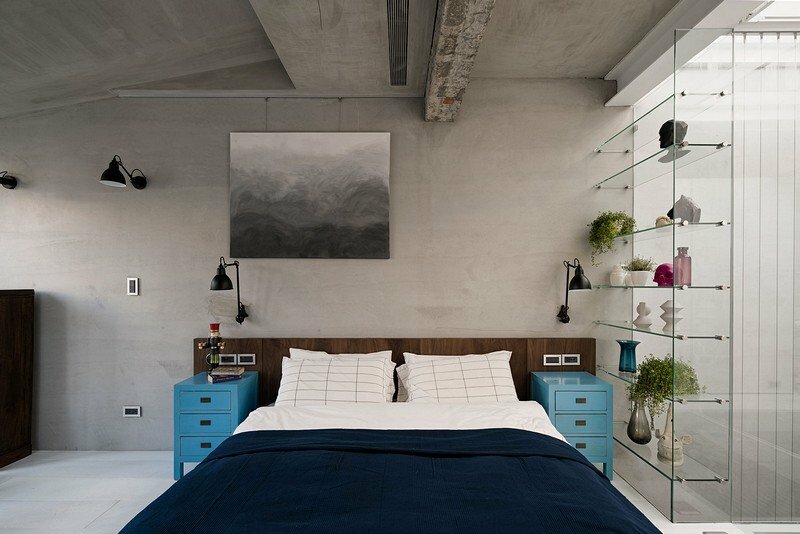 White wood floors are used and walls are with cement finish. 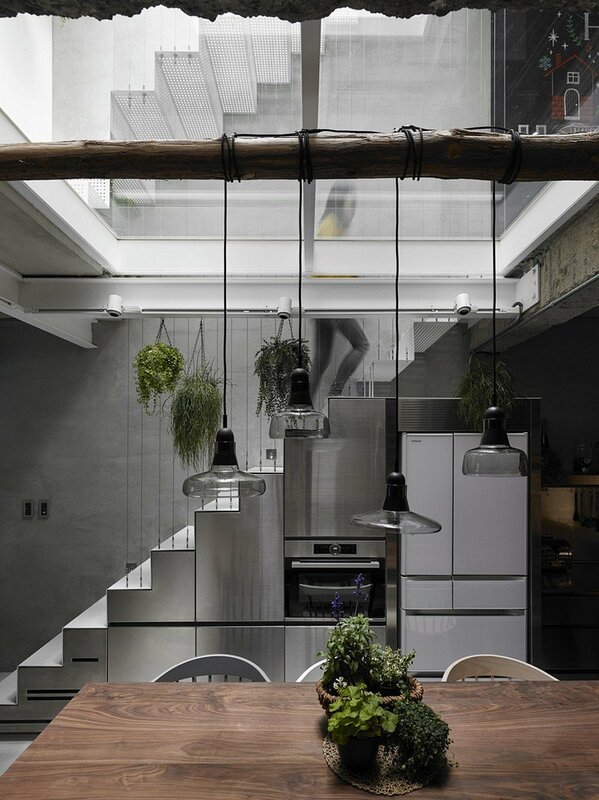 Other materials used include stainless steel, wood and glass. 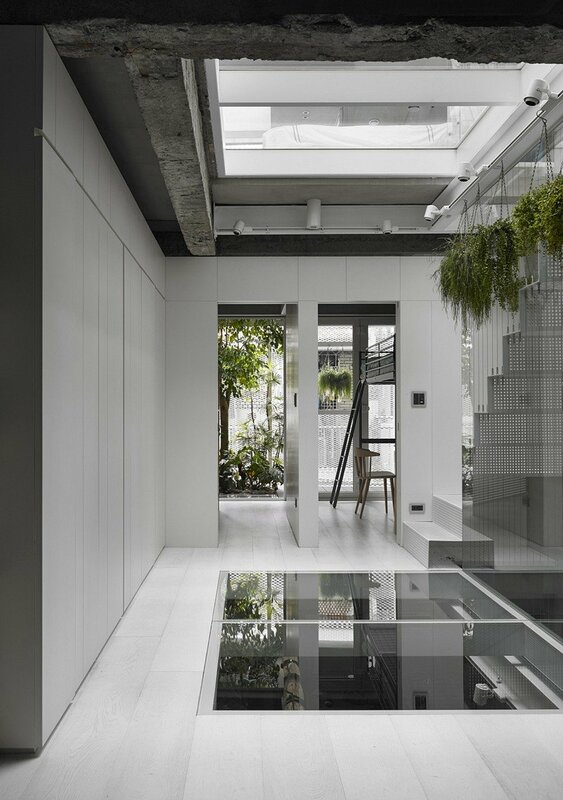 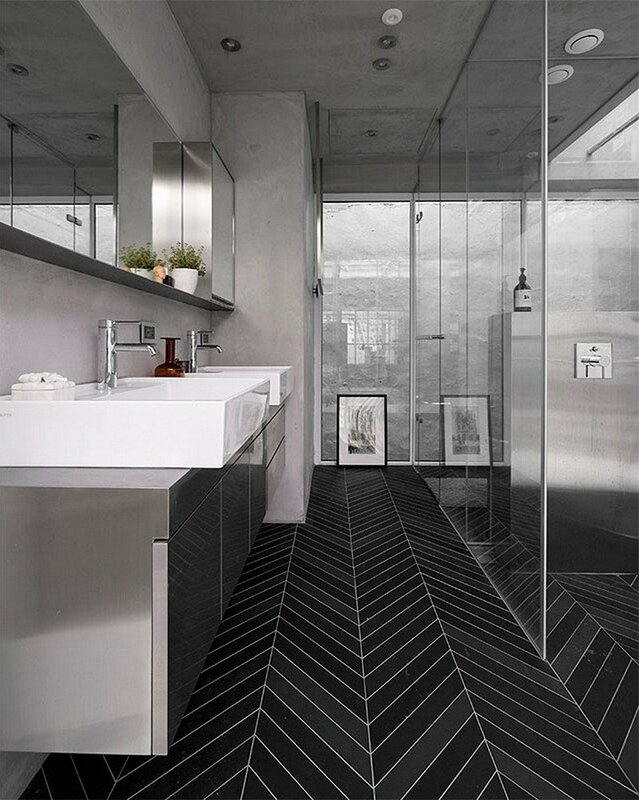 The white/gray tone have created an original feeling, while this also helps the reflection of sunlight in the house, as well as refraction of lights created by the use of glass. 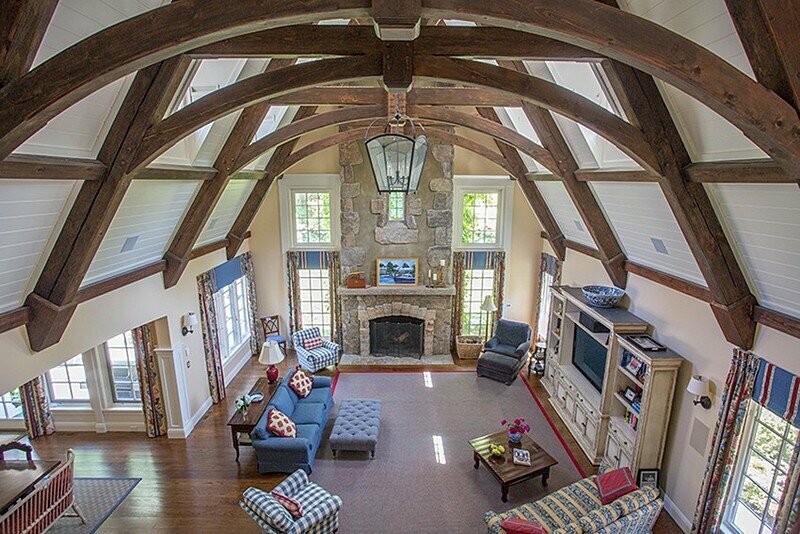 The reinforcement of beams and columns is kept without intentional concealing, allowing existence of both the old structure and new elements, to exhibit the unique quality and atmosphere of this renovated old building.